Last week, I wrote here about how Jing-A Taproom in Beijing created twelve flavor profiles for a beer using qu, the fermentation agent for baijiu, including varieties from Anhui, Hebei and Hunan. The dozen samples were tasted on Friday at The Big Smoke, where Jing-A brews, to see which ones showed the most promise. That morning tasting was challenging to say the least, which is evident from tasting notes that include “funky bugs”, “a little sweet”, “bone dry” and “like licking a stone loaded with minerals. Plus a twig.” It also required skimming flotsam off a few samples. 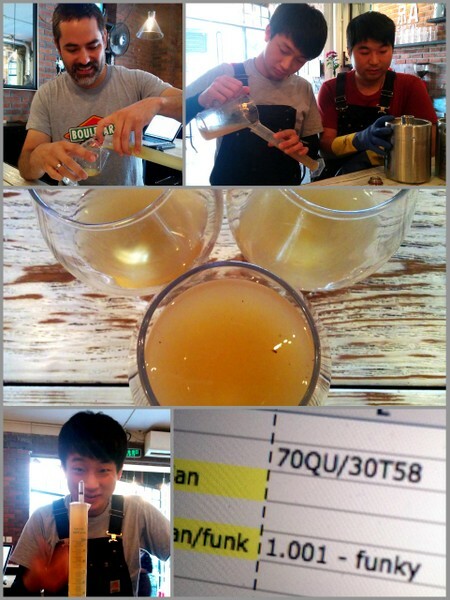 Nevertheless, the tasting was a learning experience, several of the concoctions showed promise, and that should translate into an intriguing “qu brew” come World Baijiu on August 8.